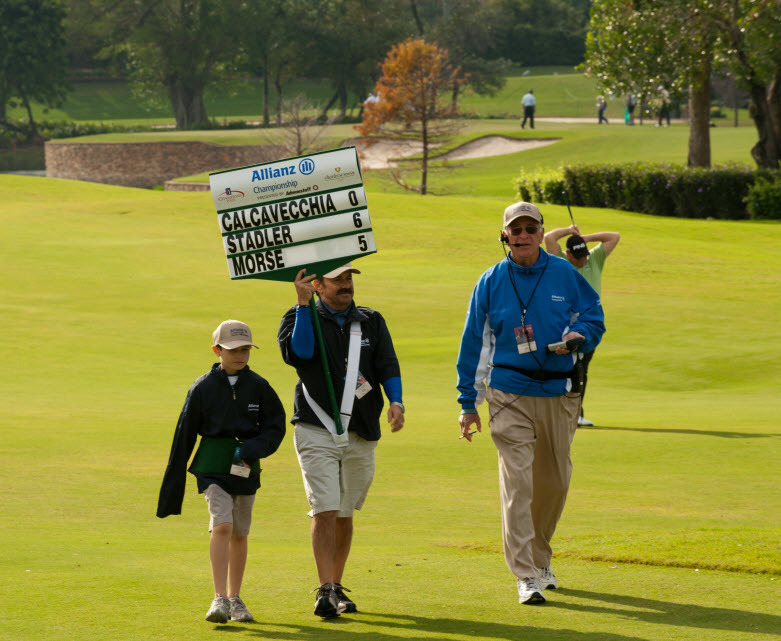 Hundreds of volunteers, ages 14 years and older, are needed to support the sixth annual Allianz Championship tournament, set to tee off February 6–12, 2012 at The Old Course at Broken Sound to drive funds to benefit Boca Raton Regional Hospital. Bringing the legendary champions of golf to Boca Raton for a celebrated week-long PGA Champions Tour tournament to vie for a $1.8 million purse, the Allianz Championship will host a variety of “events within the event” and is seeking enthusiastic volunteers to assist in many areas, from off-course such as hospitality, admissions and will call, to on-course where there is a need for marshals, media center assistance, practice facility support, etc., and special events that will help drive funds to support the hospital’s Ron & Kathy Assaf Center for Excellence in Nursing. This year, volunteers are also needed to be part of a special “green team” that will assist the tournament with educating players and spectators on Allianz Championship’s on-course “Zero Waste” initiative and assisting them with proper waste disposal. According to Allianz Championship Tournament Director Ryan Dillon, volunteers are responsible for approximately 95% of tournament week operations. He added that no tournament would be possible without the help of more than 1,000 volunteers dedicating long hours to dozens of different committees, and noted that there are many fun and interesting ways in which to get involved and a variety of reasons to do so. “Knowledge of the game is not required, just love of community, a passion for hands-on dedicated teamwork, interest in meeting new people, and being part of a new, exciting, major high visibility event that will draw a wide variety of audiences,” noted Dillon. Volunteers receive a volunteer parking pass, breakfast and lunch on work days, a volunteer badge (good for entry to event all 7 days), five “Good-Any-One-Day” tickets, admission to a fun Volunteer Party, and those volunteers who complete three shifts in the Allianz tournament will be allowed one complimentary round of golf (including cart) at The Old Course based on certain criteria. The sixth annual Allianz Championship is the PGA’s Champions Tour’s first tournament of the early-season Florida swing with the Golf Channel televising live all three rounds of the championship featuring a long player roster of golf legends such as 2011 defending champion Tom Lehman, 2010 champion Bernhard Langer, Mark Calcavecchia, Fred Couples, Nick Price, Tom Kite, Jay Haas, Fuzzy Zoeller, Tom Watson, Hale Irwin and more. The event schedule includes three days of championship play from Friday through Sunday, Feb. 10th–12th plus the second annual Women’s Executive Pro-Am on Tuesday, Feb. 7th with an Executive Pro-Am Draw Party that evening; two days of Executive Pro-Am play on Wednesday and Thursday, Feb. 8th and 9th; and the third annual “Grapes on the Green” Golf & Wine Experience and second annual Family Day during the second day of championship play, Saturday, Feb. 11th. The Allianz Championship is managed by Pro Links Sports, headquartered in Minneapolis, MN. Directing six tournaments on the Champions Tour schedule, all are continuously voted in the top ten tournaments by the players. The Boca Raton Champions Golf Charities oversees tournament operations. Those interested in volunteering should contact Volunteer Coordinator Anne Jenkins at the tournament office at 561-241-GOLF, or by e-mail volunteer@allianzchampionship.com. Online registration is available at www.allianzchampionship.com.